How do I register? You can no longer register. Some of you may have already received polling cards through the door but, if you haven’t, that only means you haven’t yet registered to vote, not that you’re not eligible. There are still 9 days to get registered to vote and it’s nice and simple – you just need your National Insurance number and to fill in a quick form online. As a student, you can register to vote both at home and at your term-time address. 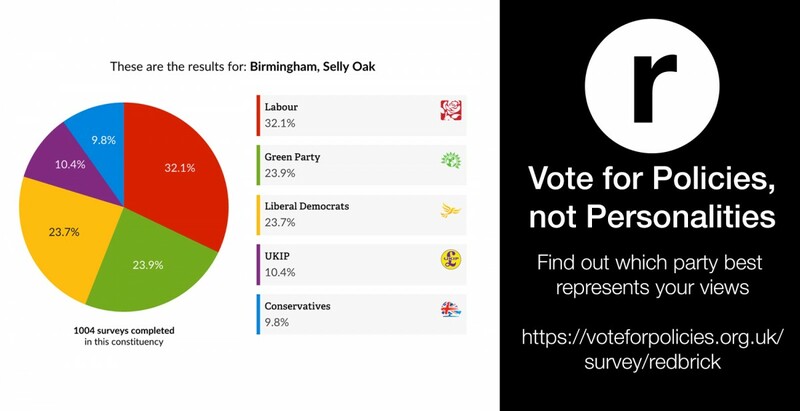 Your term-time seats are likely to be either Edgbaston or Selly Oak, you can find out which at TheyWorkForYou, which also gives a voting breakdown of your previous MP. Both of these seats were represented by Labour in the last Parliament. If you want to vote at home, but know you’re going to be in Birmingham on the day, you can apply for a postal vote. This usually has to be completed by submitting a form by post – check with your local council to be sure. Once you’ve registered to vote, you need to decide who to vote for. If you’ve got a party in mind already, that’s great – you just need to wait for polling day, but why not let us know in our poll, open every week from Monday-Friday. If not, take a look at their policies. Even better, look at the policies without the party name attached to them, and find out who you agree with most. You can choose the topics you most care about to make your choice more personal. And if you take part in this quiz by VoteForPolicies, we get to know which party is most likely to get University of Birmingham students’ support. Please take part. What do I do on the polling day? Voting is really simple. Your polling card will tell you where to place your ballot, and then you just go in on the day, give them your name and address, and then mark a cross next to your preferred candidate. As long as it’s clear which party you want to vote for, your ballot will be accepted. If you’ve chosen a postal vote to vote at home, you will receive this before polling day and it will give you information on when it needs to be submitted by. You should not put a cross in more than one box, or write or draw anything on the ballot paper, unless you want to spoil your ballot. Spoiling your ballot will result in your vote not being counted; some people do this if they do not want to vote for a candidate, or want to protest against the voting system. Your MP is decided using the First-Past-The-Post voting system. This simply means that whoever gets the most votes in your seat becomes MP. That means a candidate can win the election with just 25% of the vote in some cases. All of these MPs then sit in Parliament; there are 650 in total, representing everyone in the UK. They can form a minority government, where they try and run the country using just the number of MPs they have. These governments are usually unlikely to get their bills passed in Parliament. This last happened in 1974 and Parliament was dissolved to hold a new election after six months. They can form a coalition government, where they negotiate with other parties to form a Government made of many parties. This happened in 2010, where the Conservatives and the Liberal Democrats teamed up to form a majority Government. This coalition has survived the past five years. Once an agreement is reached, the leader of the party who wants to form a government requests permission from the Queen (for formality and tradition only), who then appoints the leader of that party the Prime Minister and requests that they form a Government. After that, the Government will set an agenda and Parliament will begin.